Harvey FeretHarvey Feret. Private equity. Montreal + Singapore. We are value investors. We focus on distressed assets. And we consistently deliver benchmark breaking returns. 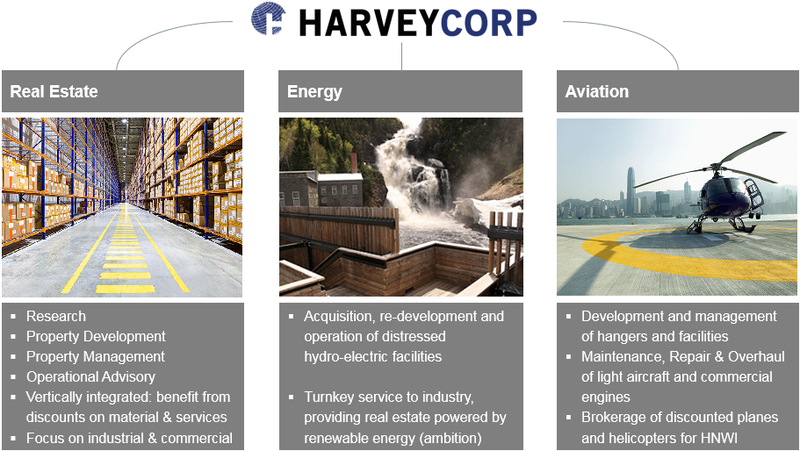 Harvey Feret is a subsidiary of HarveyCorp. We are a Canadian, family run, alternative asset manager. We focus on value investments in Real Estate, Energy and Aviation. In regards to Real Estate, we are full service and vertically integrated. We therefore benefit from discounts on material and services. We own and operate close to 500k ft2 of income producing commercial and industrial property in Quebec. We specialize in sourcing mid-sized buildings (in the range of 3M-15M CAD) at 30-60% below market valuations. We think win-win. We attract quality tenants on long term leases by sharing the benefits of our discounted acquisition, and by partnering in their success. We offer a bespoke service that includes complimentary operational advisory. We also enjoy discounted rates on material and services through our portfolio companies (we make strategic PE investments in companies that cater to the real estate industry and represent growth potential under our leadership). We handle scouting, brokerage, construction and tenanting internally. We welcome co-investments. In parallel, we are also growing into the business of fund management. We are raising capital for a boutique, income producing real estate fund that will do value added investments in distressed industrial property (requiring physical enhancements and re-tenanting) in and around the biggest economies of Eastern Canada (including Toronto, Montreal and Quebec City). Internationally recognized partners will service our fund, allowing us to focus on what we do best: deliver benchmark braking returns, with compelling liquidity and quick equity recovery.